Two Chicks On Books: Blog Tour- 32 SECONDS by Johanna Pitcairn an Interview and A Giveaway! 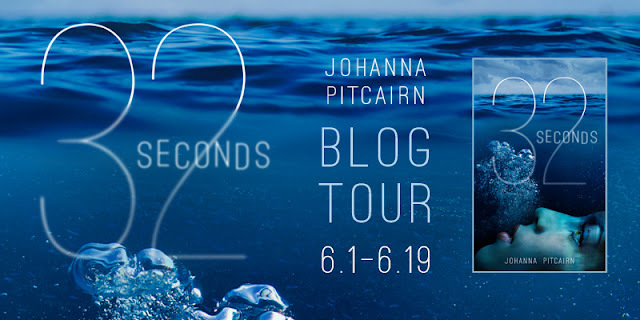 Blog Tour- 32 SECONDS by Johanna Pitcairn an Interview and A Giveaway! 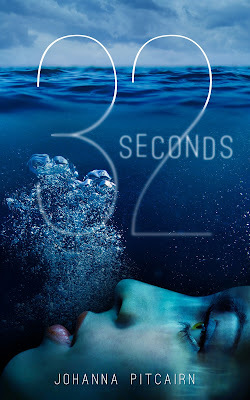 I am thrilled to take part in Johanna Pitcairn's blog tour for 32 SECONDS! I have an interview for you today. And make sure to enter the giveaway to win a hardcover of the book! Haven't heard of 32 SECONDS? Check it out! too stubborn to turn around and head home. So what’s a girl to do? 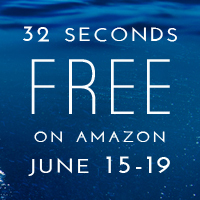 32 Seconds will be free on Amazon from June 15th to 19th! Hi Johanna! First I want to say welcome to Two Chicks on Books! 32 SECONDS sounds intriguing and I can’t wait to read it! For the readers: can you tell us a little bit about 32 SECONDS and the characters? 32 Seconds is a psychological YA fiction novel, with paranormal elements. It’s the tale of seventeen year old Julie Jones, who has lost grip with life, and is desperate to start fresh somewhere else. A broken heart has left her love sick, and an argument with her ex-boyfriend is the straw that broke the camel’s back. Her immediate and impulsive reaction is to run away from her home in Los Angeles. Left with only seventy-five bucks in her wallet, and a full tank of gas, she drives as far as she can go, and figures things out on the go. She doesn’t really have a plan, except she wants to find happiness again, a happiness she seems to have lost a long time ago. Out of ideas, she runs into a Gypsy woman who offers her a way out, and after little pondering, Julie takes it. She embarks on a journey to a parallel universe called the Underworld, which forces her back to the town of her childhood Oceanside, California, and reunites her with acquaintances and memories of her troubled past. She soon learns she can’t get out of the Underworld unless she accepts her mistakes, and changes the negative perception she has of herself into positive. To advise and guide her, her newly found friends Evan, Susan, Miko, and the twins Sky and Sloan have to sometimes play the devil’s advocate to make her see the truth behind the walls of lies she has built to protect herself. But in the end, all the tears cried are worth the struggle. It’s a mix. Julie is a mirror image of me, with some fictional tweaks. The rest of the characters are supposed to be realistic, but they don’t represent anyone in particular. They’re a blend of a lot of people I met, and fictional characters I watched in movies, or read about in books. I loved to write Julie, and her sidekick Evan. I don’t really have a least favorite. I had fun writing all the parts, and watching them come to life. Julie carries a huge weight on her shoulders, but it’s a team effort. Writing Julie was like writing about myself but transposed into the body of a seventeen year old who was born on the West Coast, and despite negative feelings, lives a very good life. Evan was fun to write because he was the advisor, the guy with the knowledge, and Julie keeps fighting him, and arguing with him, but in the end, she knows he’s right. They make a great duo. What is your favorite passage/scene in 32 SECONDS? The ending. It gives the reader a great resolution to the plot, and it carries a great message. It’s emotional, and deep, and I cry every time I read it. It was hard to write because the ending was supposed to be the grand finale. I had to make sure I wasn’t repeating myself, while raising the emotional bar to a comfortable and realistic threshold. I have a test, which is if the ending makes me cry, my job as a writer is done. My research usually consists of reading a ton of books and articles, and watch movies, and TV shows, until I find what I’m looking for. This book in particular is very personal in a way, so my research was myself. I love psychological books because all the science is inside our head. And I set the story in California, Los Angeles and Oceanside, where I’ve never lived, but which I visited a couple of times, so I used these memories too. I mostly wrote from feelings, and I transposed these feelings into scenes. For any other research, I usually just read, and talk and listen to people, and whatever else I need to do to gather the necessary knowledge to write a solid book. Right now, I’m reading the First Lodestone Trilogy by Mark Whiteway. I’m at Book 2. It’s sci-fi adventure, which is great for world building. He really started from scratch and created a whole new place, which is really well done. I use what I read as trigger for my own world building. When I read, I also study a lot. Sherlock Holmes. The guy is just too smart for his own good. I don’t know about a romantic relationship with Holmes, but I do admire the guy a lot. I wanted to try it. A lot of successful books out there are YA, and I didn’t know what I was getting myself into until I tried it, and let me tell you, it’s no joke. I enjoy it very much. YA keeps the young feelings very raw and alive. Twitter. Facebook has just become my biggest enemy – mostly because people don’t care to stay in touch via any other way than Facebook. It killed human interaction. Twitter is great for advertising. I love Twitter. No. I don’t have any phobias. I fear things, but I don’t have a phobia. I used to have a phobia of spiders, until I realized I was much bigger than them. I’m a sucker for Spotify playlists. I have my moments where I’m stuck on one song, like, The Heart Wants What It Wants, or Wrecking Ball, but right now, I’m more into a mood than a song. And my mood now is electro! Mmm, I don’t really pay attention to movie releases anymore, I’m more of a TV show (understand Netflix binge specialist) kinda gal. But I’d say Pan would be number one on my list. Thanks so much Johanna for answering my questions! Thank you! I hope you enjoy 32 Seconds! Johanna is generously offering up eCopies of 32 SECONDS to 10 lucky winners!